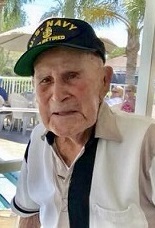 AUSTIN, Pa.----William G. “Bill” Munter, 100, of Punta Gorda, Florida, and formerly of Austin, Pennsylvania, celebrated life until his unexpected passing on Thursday, August 16, 2018, at Cole Memorial Hospital in Coudersport, PA.
Born May 2, 1918, in Brooklyn, New York, he was the son of William A. and Norah Fowler Munter. He married Grace L. Sayer in Elkton, Maryland, on August 23, 1942. She preceded him in death on April 23, 2006. He attended Nether Providence High School in Delaware County, PA, and later earned his GED. In 1938, Bill enlisted in the U.S. Army and served until 1941. He followed that with an enlistment in the U.S. Navy. In World War II, he sailed aboard the USS Brooklyn and later crewed the commissioning of the USS Lorain County. From 1962-1966, Bill was stationed with the Fleet Training Group at Guantanamo Bay, Cuba, retiring at the rank of Senior Chief Gunner’s Mate. His service continued as a civilian, employed as an instructor in small arms and tank maintenance at Aberdeen Proving Ground in Maryland. When he retired in 1981, Bill and his wife built a log home in Potter County, Pennsylvania, after spending considerable time researching how to accomplish this task. Pride in home and property were evident in how he tended his vegetable garden and fruit orchard. Known for his generosity, Bill built rocking horses for children of friends; as well as people he met throughout his travels. An avid outdoorsman, Bill fished for trout and hunted for deer and turkey in “God’s Country.” Even after he put up his handmade turkey calls, he continued to support the National Wild Turkey Federation. Bill wintered for many years in Punta Gorda, Florida, until he became a permanent resident two years ago. Bill enjoyed telling jokes, recounting life stories and raising a glass with his many friends at the American Legion Post 192 in Coudersport, PA; the VFW in Port Allegany, PA; the Elks Lodge in Deep Creek, FL; and the Moose Club in Port Charlotte, FL. At those same places, he also loved to listen to music and dance, he even showed off his moves at his 100th birthday bash at the Deep Creek Elks Lodge. Surviving are his son, William S. “Bill” Munter of Austin, PA; daughter, Grace E. Dorety of Rotonda West, Florida; and granddaughter, Denise (Mark) Vickers. In addition to his parents and wife, Bill’s two sisters, Eleanor Hetzner and Betty Waldhauer, preceded him in death. 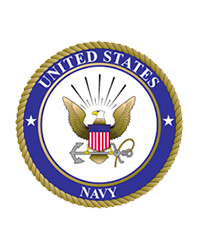 Graveside military funeral and committal services will be accorded by the U.S. Navy in Edgewood Memorial Park, Glen Mills, PA, at 2:45 pm on Monday, August 27, 2018. Bill’s family has entrusted his care to Kevin J. Dusenbury, funeral director/owner of the Virgil L. Howard Funeral Home, Shinglehouse, PA.